Overall the build quality and ergonomics are outstanding. The 25 stone maximum user capacity coupled with an excellent warranty of Lifetime Frame / Motor / Brake, 3 years parts and 3 years labour highlights just how solid and well-built this machine really is! The stride length is fixed at 20 inches so it’s perfectly suited to users over 5’4” (if you’re under that height, you may possibly feel the distance a bit of a stretch).Whether going forwards or backwards, the dynamic handles coped well under heavy upper-body pressure and the feel underfoot was just as impressive. The oversized pedals are pitched at a bio-mechanically ‘sweet’ angle and the distance between them (The Q-factor) is so small that your hips and feet are put in a natural and comfortable position throughout. By a combination of the curved crank arms gliding along the thick guide rails on chunky rollers and the momentum produced by the heavy 23lb flywheel, results in a superbly fluid elliptical motion. The well laid-out, intuitive console is also a pleasure to use. Instead of trying to view all of your feedback on one display, the upper portion of the console is neatly divided with a selection of LED screens, each dedicated to showing certain data. In the middle is the largest of the screens with bright orange dot matrix LEDS representing the segment of the course profile you are working through. To either side of that are two displays showing ‘Time’ and ‘Distance’ and a wide display screen stretches under them showing the other important feedback such as Calories, Speed, Heart Rate etc. Pressing the ‘Change display’ button allows the user to alternate between viewing Watts to seeing the Calorie consumption figures. Even the measurement units can be changed from Miles to Kilometres if you prefer. The console allows users to programme in two permanent users and a guest user. By inputting personal data such as weight and age the computer can provide more accurate calorie consumption figures through the workouts. Under your profile you can log workouts and set yourself goals. The goals can be programmed around the number of miles you wish to cover, time or calories burned and will remain set in the machine for a week. Each time you use the machine you are given a progress report and if you are have successfully achieved your goal at the end of the week. It will also provided users with details on their average workout as well as a running weekly total and overall lifetime total. The concept works quite well in getting the user in the habit of consistent training and having the goals set over a week keeps things manageable in terms of short term targets. 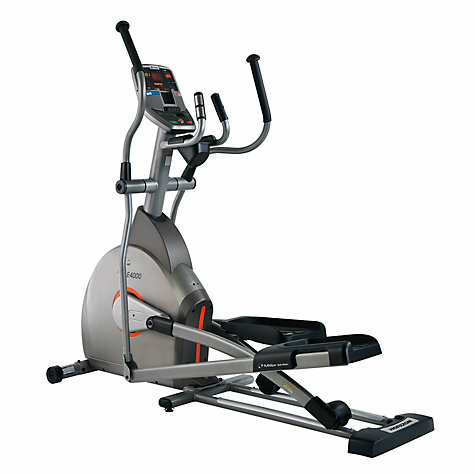 Aside from the Manual session, the machine comes with a good array of programmable options. There a 10 preset programmes including individual, weight loss, toning, wattage, cardio, hills and more. There are also heart rate control sessions with both Target heart rate and interval heart rate workouts which utilise the free Polar heart rate chest strap. 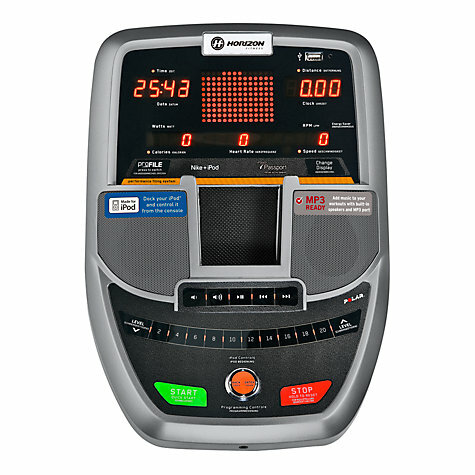 It’s a great bonus that Horizon have included this transmitter as although there are pulse grip sensors on the static handles for basic heart rate readings, we always advocate using the inbuilt receiver for far greater accuracy as well as being able to enjoy the HRC programs and the dynamic handles for upper body conditioning! There are also three custom settings where you can create and store your own programme and change them as and when you wish. The custom programmes can be set for anything up to 99 minutes and allows you to alter the resistance for each minute segment as you choose. The actual setting up process is made quick and easy by using the one-step resistance keys on the console. There’s no need to scroll through levels with up and down arrows for each segment, you just press the one-touch key labelled with the resistance level you want to work at followed by ‘enter’ and you can whizz through the set up process in no time creating some unique and challenging courses. Speaking of challenges, the 20 levels of resistance should offer plenty! The top setting is nice and tough but a combination of plenty of increments and those quick keys make adjustment swift and easy so you can remain in control at all times. As well as the courses that come with the package, there are also various video destinations available to buy online like ‘The Pacific NorthWest’, ‘The Swiss Alps’ and many more meaning that this ‘add-on’ can offer long-term appeal. As worthwhile as the ‘Passport’ option may be for some users, it’s more important that the machine comes with good features as standard – and the E4000 certainly doesn’t disappoint! The centre of the console is dominated by a neat docking station with speakers to either side. Once the iPod is connected, the onboard console buttons can be used to control it. Plus if you don’t have an iPod then you can still enjoy the music via an MP3 jack. Thanks to the quality of sound that comes from the speakers as well as the user-friendly lay out of the play and volume controls, we really feel that the large proportion of console space that Horizon have devoted to music features is well justified! The carefully considered layout extends just under the console too with a generously sized storage holder that stretches between the two static handlebars. Not only does this allow for plenty of room for a water bottle, you can also stick your MP3 Player in there if there isn’t room up on the console. Speaking of ‘room’, this is obviously a big, heavy, robust machine that isn’t designed to fold or ‘tuck away out of sight’ too readily, having said that, it does have transport wheels on the front stabilisers which helps wheel it around if necessary. The Horizon Elite E4000 is not currently available from any retailers we're aware of in the UK. Overall we were impressed by the Elite E4000. The build quality is very good with a warranty to back it up. There’s not a particularly exhaustive array of preset programs but certainly enough to keep boredom at bay for the majority of users. For the rest, they have the option of investing in ‘Passport’ and that should certainly keep anybody entertained! If you want a comfortable, solid, user-friendly and engaging machine then the E4000 is a great choice. Not a huge array of Pre-set programs but it’s easy to create your own!